Individuality Swimming and Fitness is run by a team of STA and ASA qualified swimming teachers at local pools in Branksome, Poole, Canford Heath, Wimborne, Wareham, Sandford, Wallisdown, Talbot Heath, Ringwood, Ferndown & Bournemouth. The team offer a range of swimming lessons for babies, swimming lessons for kids and adult swimming lessons. Learn to swim at one of the Poole hotels or local community pools used by Individuality for swimming classes for kids in Parkstone, Poole, Hamworthy, Branksome Park, Canford Heath, Wallisdown, Talbot Heath, Sandford, Ringwood and Bournemouth. Aqua Natal classes are run at several pools in Poole and Bournemouth. Exercising in the water whilst pregnant is the safest way to exercise as the water takes the pressure and weight of your bump off of your joints and can help to ease pregnancy aches and pains. 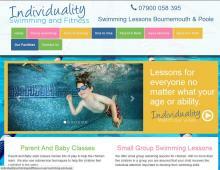 Call Individuality Swimming for more information on their aqua natal exercise classes in Poole and Bournemouth. Join your baby swimming in the pool while they take part in one of the baby swimming lessons where lots of play is used to help the little ones learn and gain confidence in the water. Individuality’s Pre-School and toddler swimming lessons are the perfect swimming lessons for children under 5, the children are taught in small groups by qualified swimming teachers. Swimming lessons for kids are fun with Individuality Swimming. Only small groups of no more than 5 children mean that your child will learn to swim quickly and build confidence in the water. ASA Ducklings, Water Skills & Distance Awards are followed, as we all know kids love getting badges for their achievements! If you are looking for private one to one swimming lessons or group swimming lessons for babies, kids or adults in the Poole, Bournemouth, Wimborne, Sandford, Ferndown & Ringwood areas, contact Individuality Swimming and Fitness. Individuality Swimming now sell a great range of adults and childrens swimming goggles that can be ordered through their online shop. They only stock the best, most durable kids swimming goggles which have been tried and tested over many years. Stocked in various colours and sizes you can buy kids, junior and adult swimming goggles from this Dorset based company.